Apples are a great source of vitamins A and C. They contain a healthy dose of quercetin, a powerful flavonoid with antioxidant properties, which helps protect the heart and arteries, and may help combat some cancers. Already a favorite in sweet desserts like pies, cakes, tarts and crisps, apples are a wonderful addition to savory dishes as well. We’ve profiled a few examples of how to best take advantage of this fruit when it’s at its peak. Add it to desserts like a parfait, use it to create a rich and creamy vinaigrette, or add it to cheesy dishes like mac and cheese. Chutney is a favorite condiment for everything from cheese to roasts. Unlike applesauce, with its subtle sweet flavor, apple chutney is not only sweet, but also sour and spicy. Spread it on sandwiches, or slather it on burgers. 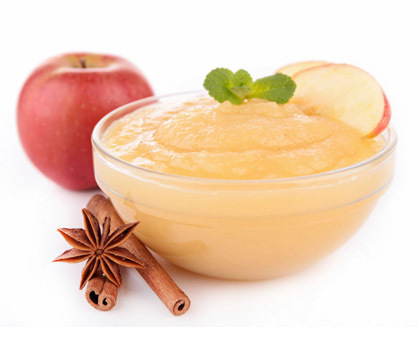 Apple butter is a highly concentrated form of applesauce created by cooking apples slowly with cider until the sugar in the apples caramelizes, turning the apple butter a deep brown. The rich, complex flavors of apple butter add dimension to pork chops or chicken, and also work well spread atop latkes and pancakes. Apple juice isn’t just a refreshing beverage. Use it as a substitute for wine when deglazing a pan. It can be used as an ingredient when making a glaze for pork chops, chicken or ham. Use apple juice in place of brown sugar when making roasted acorn squash. Add apple juice to iced tea for a slightly tart, slightly sweet flavor.